This entry was posted in Race Updates on March 26, 2009 by WSG. It’s time for “running of the buffalo’s”, team mate Jim Skaggs throws down a trio of races on Utah’s Antelope Island. This has to be one of the most unique trail races around, it feels like your running on the moon which is surrounded by the stinky Great Salt Lake. Enjoy the scenery and watch out for the Buffalo’s, there’s no trees to hide behind once your out there. Meltzer and I will be runing the Lower Frary Peak Aid Station, you must bahahah, scrape and snort when entering the aid, C-ya Saturday! This entry was posted in Shoe Reviews Speedgoat Updates and tagged Wasatch Speed Goat Mountain Racing Team on March 22, 2009 by WSG. The Wasatch Speed Goat Mountain Racing Team protect their hooves with the sleek La Sportiva Trail Shoes, if your favorite La Sportiva Trail Shoe is not on sale, go ahead and use the Speed Goat Coupon.. This entry was posted in Speedgoat Updates on March 19, 2009 by WSG. Feel free to bookmark the new Wasatch Speed Goat Mountain Racing Team Blog, all 25 runners will be posting race reports, gear reviews and industry news. If you want to keep up with the gear we use and the races we run feel free to visit our goat page, 10 scrapes.. This entry was posted in Shoe Reviews on March 7, 2009 by WSG. This entry was posted in Gear Reviews on March 2, 2009 by WSG. The Wasatch Speed Goat Mountain Racing Team powered by First Endurance! Karl Meltzer introduced me to First Endurance three years ago and I haven’t stop improving since then. With the heavy demands we put on our body it’s tough to keep up with nutrition. Lance Armstrong’s Astana Cycling Team is also powered by First Endurance products….Scrape on!! 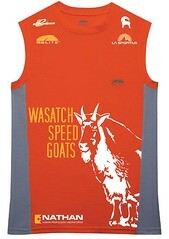 “Just wanted to drop a quick note and say thank you for sponsoring our Wasatch Speed Goat running team. I am a firm believer in your products and put MultiV, OptygenHP, Liquid Shot, and Ultragen to the test over the past two months leading up to the Moab Red Hot 50K+ race last weekend. Karl turned me on to Ultragen last year, and I have been taking the vitamins and Optygen every day for the past 2-3 months. LS was my fuel of choice for the race. I had a great day in Moab and give a lot of credit to First Endurance. I couldn’t believe how easily I was beating my targeted splits, and with such a moderate heart rate (for me). Truly a fantastic feeling. Yes, I trained a lot as well – but I feel that the FE products really made a difference in how my body was able to absorb the training I was doing.